Vortex introduced their new Viper HS-T rifle scope. 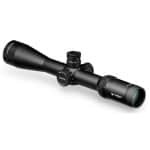 HS-T stands for Hunting Shooting Tactical and is position as a multi-use rifle scope. The new scope is a blend of features that the Viper HS and Viper PST rifle scopes offer. This new riflescope is available as a 4-16×44 MOA and mrad models. The magnification of 4-16x clearly shows that Vortex positions this new scope in the long-range hunting market. The HS-T riflescope also hosts the complete new second-focal-plane reticle which is perfect for accurate holds at extended ranges. The Vortex Viper HS-T 4-16x44mm provides precision-style windage and elevation turrets. These are durable and allow repeatable adjustments which enable accurate long-range shots. Vortex also included their CRS system which is short for Customizable Rotational Stop. This simply means that you can quickly re-index the turret after you did temporary elevation corrections. The scope also offers a generous 4 inch eye relief. The eyepiece boasts fast focus capabilities which allow you to target with ease. Vortex also included their XD glass (extra low dispersion) which ensures crisp and sharp images even on all edges. The lenses are treated with Vortex’s XR coatings to offer superior light transmission. This improves targeting in low light environments. The exterior lenses are treated with an ultra-hard coating called ArmorTek. This coating safely prevents scratching as well as oil and dirt. The Vortex Viper HS-T 4-16x44mm rifle scope is o-ring sealed. It’s purged with argon gas to provide 100% water- and fog-proof features. The design is shockproof so it easily withstands recoil and impact in hunting situations. Overall, the Vortex Viper HS-T 4-16x44mm is an impressive riflescope. It offers fantastic features at a great price. Check out the Vortex Viper HS-T 4-16x44mm by clicking on the link or the image above.